I may be in trouble for posting a doughnut recipe that is fried, not baked in a molded pan, all oil-free and healthy-like. I might try the baked doughnut trend one of these days, but for now, I’m making them deep-fried because those are the kinds of doughnuts my little girl heart identifies with. You see, I once had a Great Grandmother that lived with my Great Grandfather in a little tiny blue house that was connected to the big blue home my Grandparents lived in. When we went to visit my Grandparents, I would always slip on over for a visit. My Great Grandmother was a sweet, quiet little woman with a puff of fluffy white hair and a wooden vanity in her bedroom full of brilliantly colored, ornately decorated costume jewelry. Her name was Erma. She let me dress up in her necklaces and earrings to my hearts content. She had a large, puffy, and may I mention, selectively ferocious cat that she let me name ‘Precious’ (Precious and I got on splendidly….with some of the other grandkids, not so much). And she always, always had treats for me. Always homemade. Treats that are burned into my memory along with the way my Great Grandparents treated me with so much love and acceptance. Like I was so perfectly wonderful and uniquely special, awkward a little girl as I was. Treats like homemade pineapple ice cream, churned in a large wooden, hand cranked Ice cream maker. 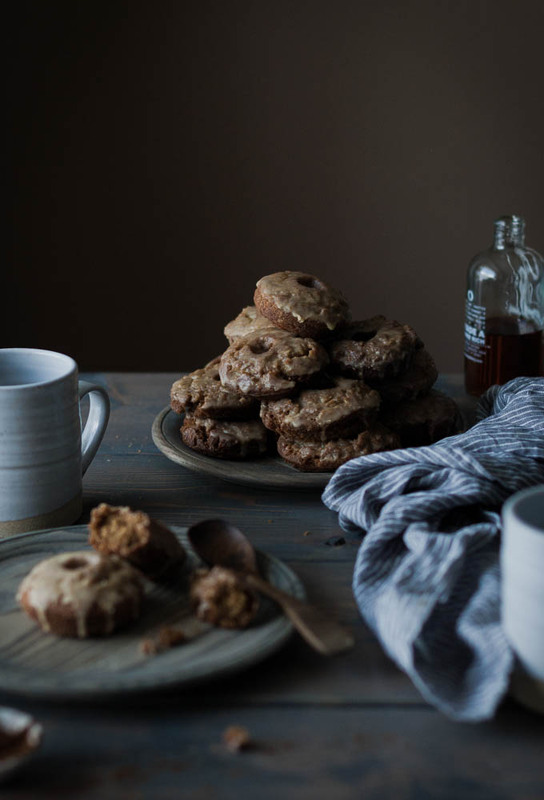 Treats like spiced cake doughnuts – nutmeg and clove scented, and always deep fried. 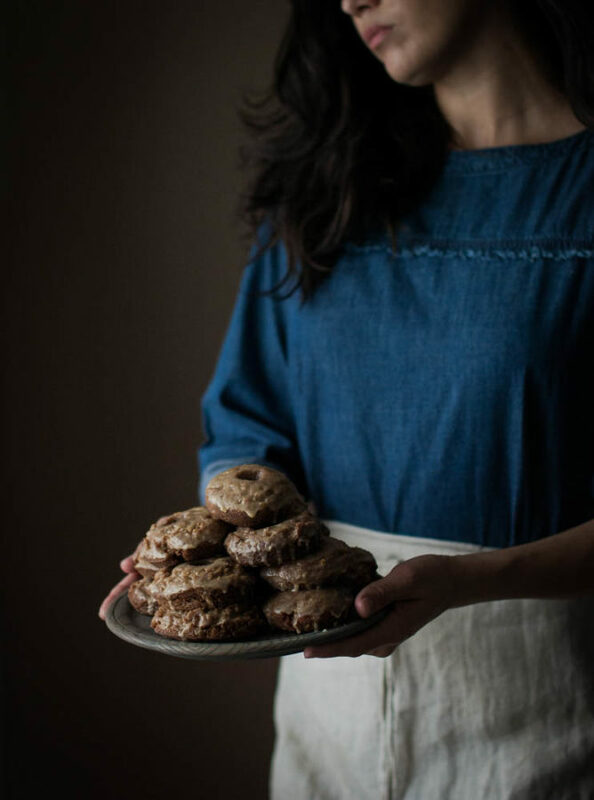 I’ve made her spice doughnuts over the years, usually when a bout of sentimentality strikes. Simply the smell alone invites to my mind flashes of her cloud-soft white hair. Sitting on a little stool in front of that vanity mirror, clipping on sparkling earrings that drooped with colorful stones while my Great Grandma silently watched with a smile. Desperately trying to get in and out of her little bathroom as quickly as possible so that I wouldn’t be inside when the old wooden cuckoo clock went off (What?! Cuckoo clocks are remarkably terrifying to a highly imaginative 7 year old). 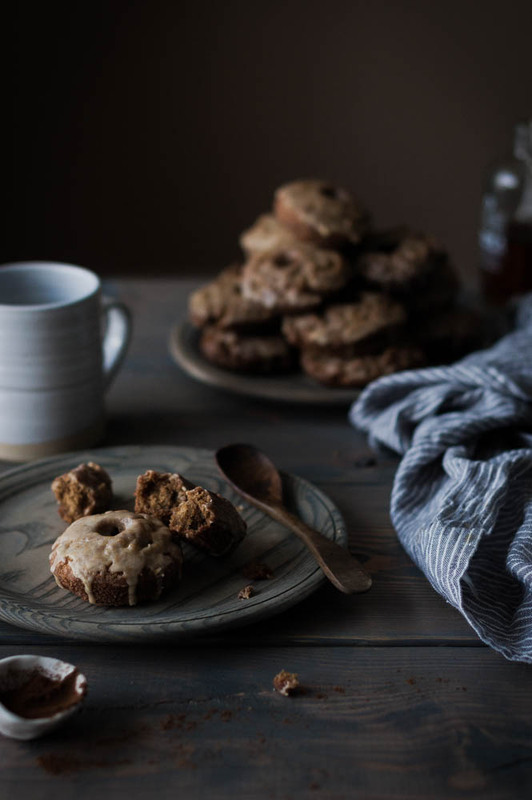 Most of all, deep-fried spiced cake doughnuts taste like love. My Great Grandma passed away when I was eight or nine. My thirty something year old self still misses her. Isn’t food laced with memories, affection, and even a little heart ache, the best kind of food? 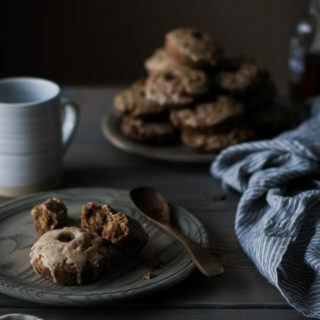 These pumpkin doughnuts are my take on, and tribute to my sweet little great grandma. 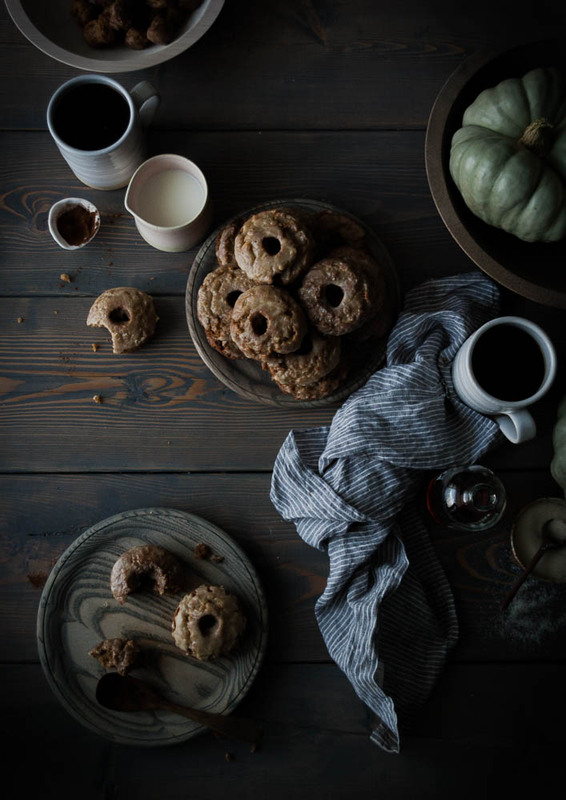 Though the doughnuts in my memory were simply flavored with an array of spices, made with conventional ingredients, I chose to add in a bit of pumpkin for more flavor and moisture as well as making them gluten free. Ever since picking up my friend Alanna’s book “Alternative Baker“, I’ve had my eyes opened to a whole new world of gluten free flours. I am currently loving the combination of oat, sweet rice, and millet flour for super soft and flavorful baked goods. These doughnuts are so so SO so soft. Spiced with nutmeg and ginger, cloves and cinnamon. Though the inside is fluffy and soft, the outside gets that crunchy crisp that only something that has been deep-fried can. They are dipped in a simple maple glaze. 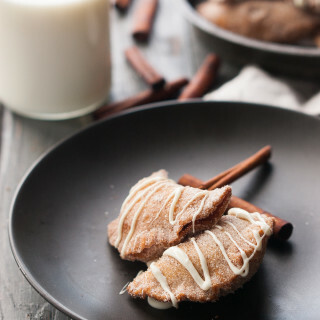 You can use simple confectioners sugar to make the glaze, or you can make your own powdered sugar out of raw cane or turbinado sugar (grind it up to a powder in a food processor) to keep it lower in refined sugar. 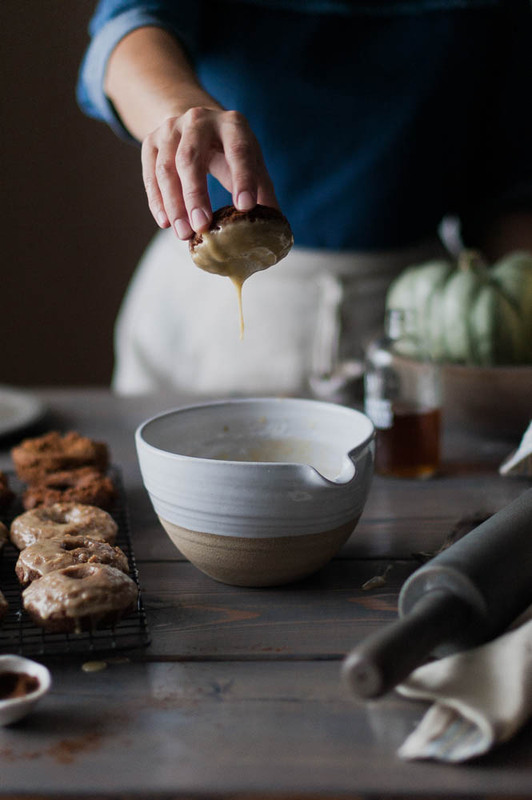 You can use canned pumpkin in the doughnut recipe, of course. But I have to tell you about my favorite alternative to canned pumpkin at the moment: roasted Red Kuri Squash puree. Or any other similar squash, really. I love using the Red Kuri or Kabocha squashes, though. 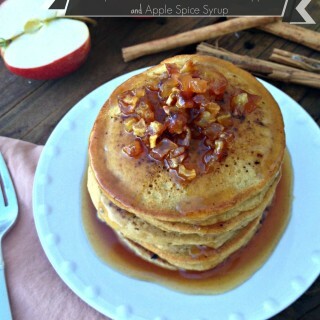 They have so much flavor and the texture is just gorgeous! 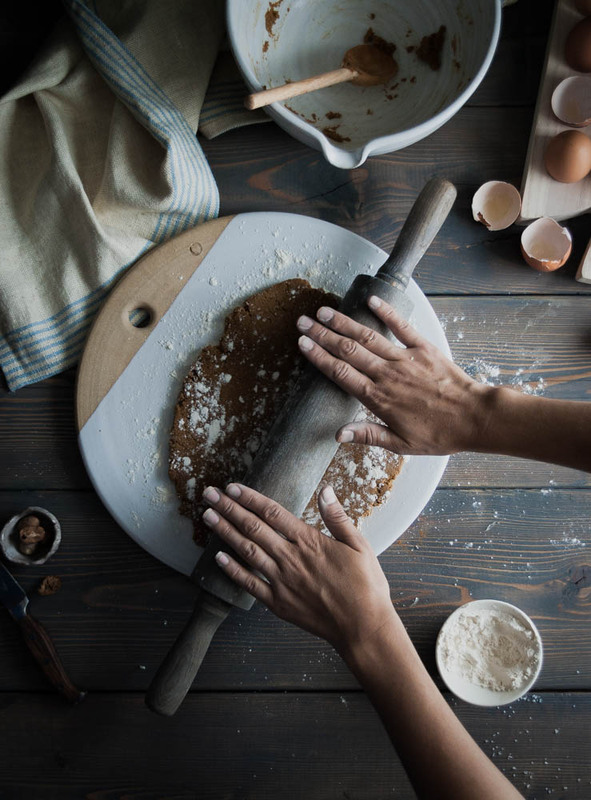 Place the oat flour, millet flour, sweet rice flour, cinnamon, cloves, ginger, nutmeg, baking soda, baking powder, and salt in a large bowl and whisk together. Set aside. In another mixing bowl, whisk together the egg, buttermilk, pumpkin puree, coconut palm sugar, and maple syrup until smooth. Add the dry ingredients to the wet ingredients and mix together with a spoon until a thick dough forms. NOTE: this dough will be slightly soft and sticky. 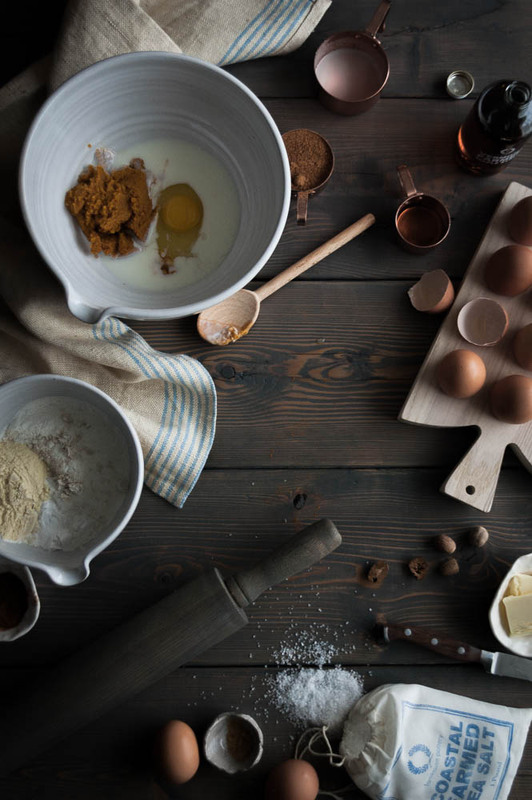 Dust your work surface generously with oat flour. Place the dough on the floured surface. Dusting your hands well with flour, press the dough down to flatten a bit. Dust the top of the dough generously with oat flour and roll out gently to about a ½"-3/4" thickness. 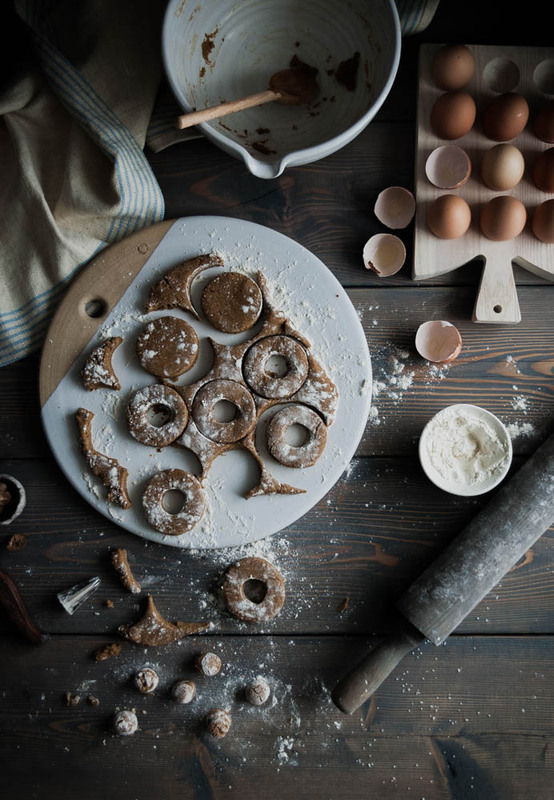 Cut rings out of the dough using a well floured doughnut cutter. My cutter was about 2½" in diameter. Heat about 3" of cooking oil in a large pot to 350 degrees (a candy thermometer works great for this). Fry the doughnuts and holes, 3-4 at a time until golden brown and puffed on the outside. Each doughnut should take roughly 2-3 minutes to cook. Check to make sure doughnuts are cooked thoroughly on the insides and fry for a longer amount of time, if needed. Drain the fried doughnuts on a paper towel. When the doughnuts have cooled, dip the tops in the maple glaze and place on a wire rack to set. Best eaten the same day cooked. 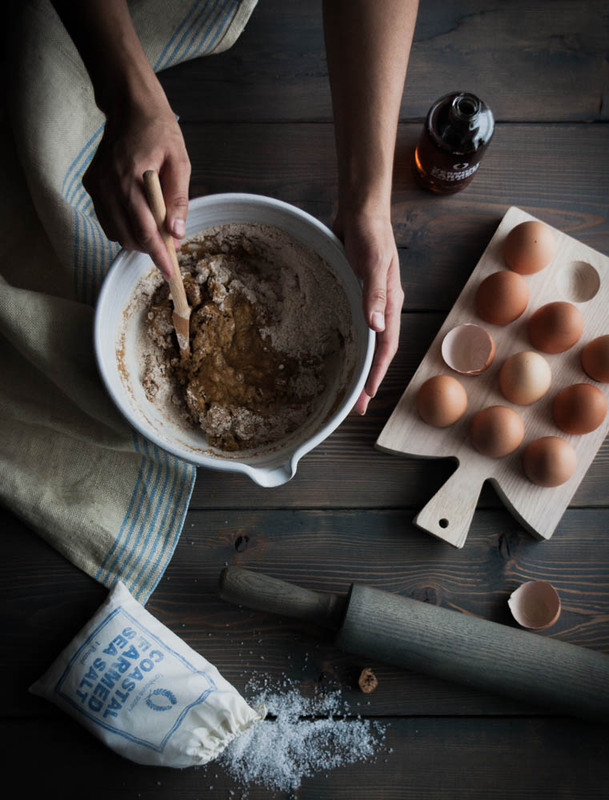 Place the confectioners sugar and maple syrup in a mixing bowl and whisk together. Whisk in water, 1 tablespoon at a time, until the glaze is smooth and runny, yet thick enough to coat the back of a spoon. Use to glaze doughnuts. 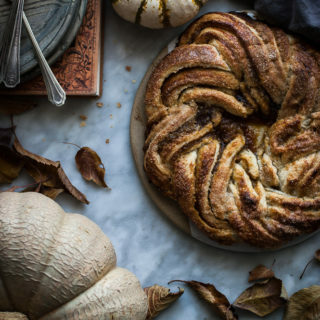 In a fall baking mood? Try these!